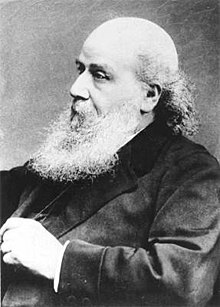 James Joseph Sylvester FRS HFRSE LLD (3 September 1814 – 15 March 1897) was an English mathematician. He made fundamental contributions to matrix theory, invariant theory, number theory, partition theory, and combinatorics. He played a leadership role in American mathematics in the later half of the 19th century as a professor at the Johns Hopkins University and as founder of the American Journal of Mathematics. At his death, he was professor at Oxford. James Joseph was born in London on 3 September 1814, the son of Abraham Joseph, a merchant. James later adopted the surname Sylvester when his older brother did so upon emigration to the United States—a country which at that time required all immigrants to have a given name, a middle name, and a surname. At the age of 14, Sylvester was a student of Augustus De Morgan at the University of London. His family withdrew him from the University after he was accused of stabbing a fellow student with a knife. Subsequently, he attended the Liverpool Royal Institution. On his return to England, he was hired in 1844 by the Equity and Law Life Assurance Society for which he developed successful actuarial models and served as de facto CEO, a position that required a law degree. As a result, he studied for the Bar, meeting a fellow British mathematician studying law, Arthur Cayley, with whom he made significant contributions to invariant theory and also matrix theory during a long collaboration. [incomplete short citation] He did not obtain a position teaching university mathematics until 1855, when he was appointed professor of mathematics at the Royal Military Academy, Woolwich, from which he retired in 1869, because the compulsory retirement age was 55. The Woolwich academy initially refused to pay Sylvester his full pension, and only relented after a prolonged public controversy, during which Sylvester took his case to the letters page of The Times. In 1883, he returned to England to take up the Savilian Professor of Geometry at Oxford University. He held this chair until his death, although in 1892 the University appointed a deputy professor to the same chair. He was on the governing body of Abingdon School. Sylvester died in London on 15 March 1897. He is buried in Balls Pond Road Jewish Cemetery on Kingsbury Road in London. ^ a b "Sylvester, James Joseph (SLVR831JJ)". A Cambridge Alumni Database. University of Cambridge. ^ Bell, Eric Temple (1986). Men of Mathematics. Simon Schuster. ^ "Preliminary Outline of Instructions for the Session Beginning October 3, 1876". Johns Hopkins University. Official Circulars. No. 5. September 1876. ^ Hawkins, Hugh (1960). Pioneer: A History of the Johns Hopkins University, 1874-1889. Ithaca, NY: Cornell University Press. pp. 41–43. ^ J. J. Sylvester (1851) "On a remarkable discovery in the theory of canonical forms and of hyperdeterminants," Philosophical Magazine, 4th series, 2 : 391–410; Sylvester coins the word "discriminant" on page 406. ^ J. J. Sylvester (1879) "On certain ternary cubic-form equations," American Journal of Mathematics, 2 : 357–393; Sylvester coins the term "totient" on page 361: "(the so-called Φ function of any number I shall here and hereafter designate as its τ function and call its Totient)"
^ a b Dickson, L. E. (1909). "Review: Sylvester's Mathematical Papers, vols. I & II, ed. by H. F. Baker". Bull. Amer. Math. Soc. 15 (5): 232–239. doi:10.1090/S0002-9904-1909-01746-X. ^ Dickson, L. E. (1911). "Review: Sylvester's Mathematical Papers, vol. III, ed. by H. F. Baker". Bull. Amer. Math. Soc. 17 (5): 254–255. doi:10.1090/S0002-9904-1911-02040-7.